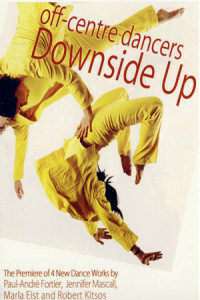 Jacqueline Levitin collaborated with choreographer Jennifer Mascall and composer Michael Vincent on a feature work for the Off Centre Dance Company entitled “Just Barely,” which premiered at SFU Burnaby Theatre on April 8 and 9, 2005. “Just Barely” reprised five of the Bach “Goldberg Variations” as played by Glenn Gould. Jacqueline Levitin created five complementary live video backgrounds for the dancers on the stage, beginning with abstract images moving to the sounds of the Goldberg variation, three different image-extensions of the dancers movements, and finally a stylization of Glenn Gould’s fingers moving in close-up on the piano. Jacqueline Levitin created a live video environment for the second, third and fourth acts of the play Smitten: A Midsummer Night’s Dream put on by the TOOBA Theatre Ensemble. Based on the Shakespeare play, TOOBA’s version moved the audience from room to room following the locale of the action. For Act II, the audience found themselves surrounded by a green forest that magically came alive with the spells of Puck, and Titania and Oberon, the Queen and King of the fairies. 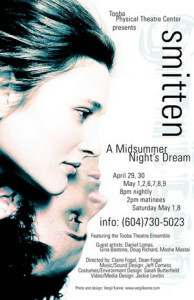 Smitten: A Midsummer Night’s Dream took place at the TOOBA Physical Theatre Centre (Vancouver), April 29-May 9, 2004.